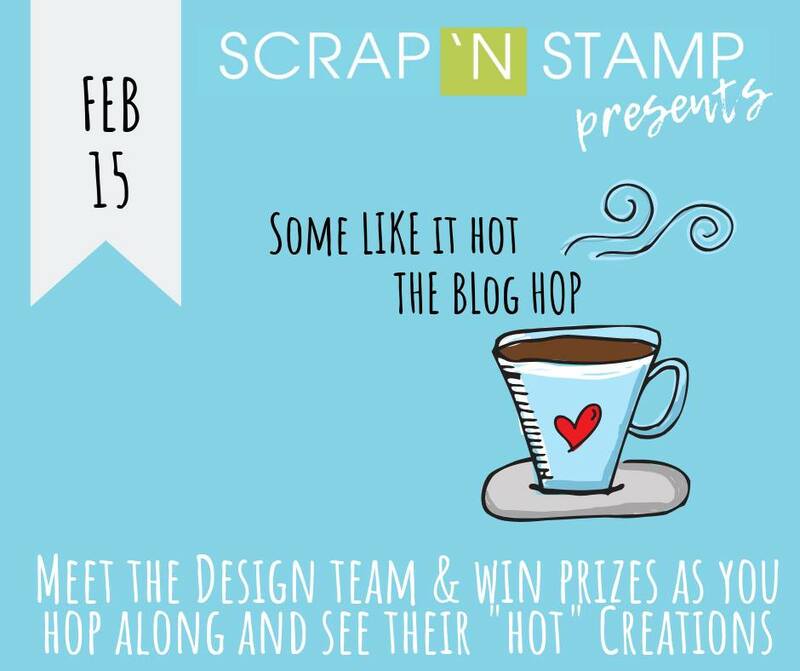 This Blog Hop is coffee, tea or hot chocolate themed. I was so thrilled to see this great Lawn Fawn stamp set and bought it as soon as I saw it. And since I don't drink coffee, I decided to make mine a hot chocolate card. 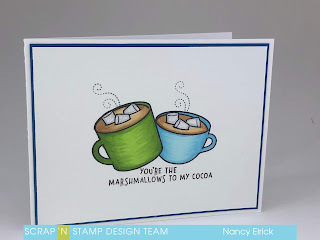 All I could think while I was making this card on a very cold and snowy day, was that I really wanted a hot chocolate! I stamped the green mug first... then stamped it again on a full sticky Post-It note and cut it out to create a mask so that I could stamp the smaller cup so that it looked like it was behind it. I added the interior stamp of the marshmallows that also gave the line to show the inside rim of the cup. I used Memento Tuxedo Black ink to stamp the cups and marshmallows. 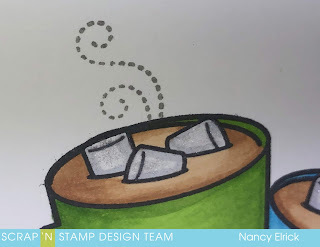 I coloured both cups and the hot chocolate with Copics (E30, E33, YG17, YG23, BOO, B02 and C1) and then added the steam in a light grey ink and the sentiment in a chocolate coloured ink. I added a blue layer behind my white layer and then put it all on to a white card. I added some shading to the marshmallows with a light grey Copic and then used a Nuvo Aqua Shimmer Pen to create a little sparkle on the marshmallows. 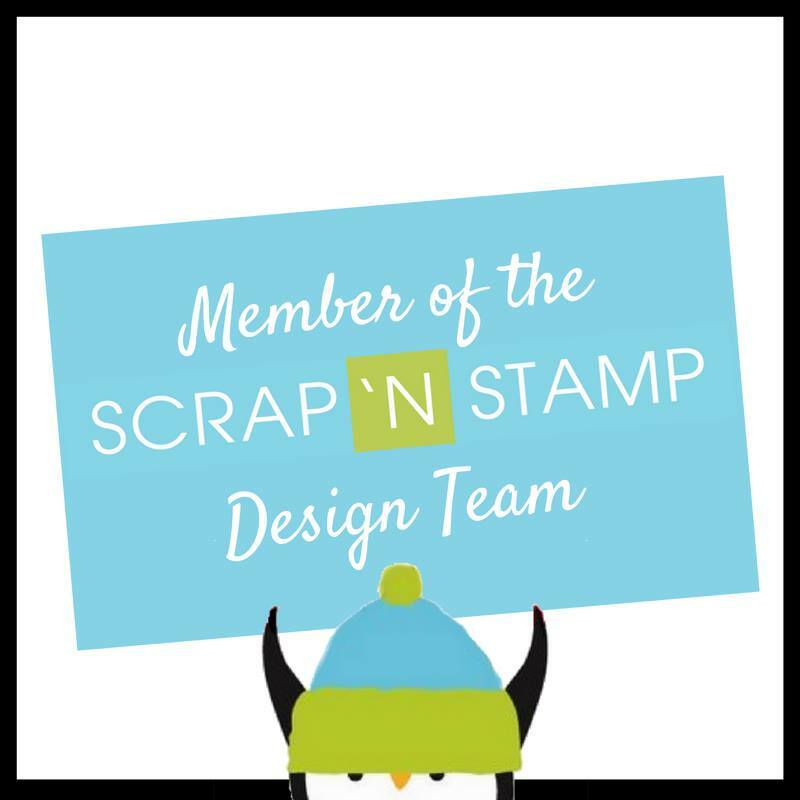 I hope you will follow along with the rest of the blog hop to see what the other members of this fabulous design team have come up with! Your next stop is KIA!! I look forward to seeing what you come up with for our theme!! Of course, there are prizes to be won! We will be giving away a total of 9 prizes! There will be one prize from each of the designer blogs listed below as well as one prize of a $50 gift certificate chosen randomly from all of the people who comment! Be sure to visit all the links below and leave your comments for your chance to win! I've had more hot chocolate this winter than I have in years... stupid cold weather! I love how you let your hot chocolate mugs take center stage - they deserve the spotlight! Your colouring is fabulous. Love this Nancy!! It's cute, clean and simple perfection and has me heading to the kitchen to make hot chocolate on this cold day. Love it Nancy!! The marshmallows turned out great! Great card Nancy! Love the clean look of this card! Great card and wonderful colouring! Awesome colouring and masking!! Fabulous card!! Thanks Laurie... if only you knew how long it had been since I'd masked something LOL! CAS perfection! Love how you colored the mugs! Darling card! Love the cups of hot chocolate and marshmallows! Awesome stamp set! It sure is a great set! Glad I have it in my stash! The shimmer pen is a great addition to the marshmallows. I <3 the shimmer pen! Nice coloring of the cups! And nice clean design! Hot chocolate is my favorite to warm up on a cold day :) Awesome card! I am not a coffee drinker so I agree with you! Love your card. I think coffee, tea, or hot chocolate cards are some of my favourite themes for cards! It was a struggle for me as I'm not much of a hot drink person.... but I'm pleased with the card and really like the stamp set! What a nice clean simple card...well done. I just love your card and there is enough cold weather to warrant a mug of hot chocolate. It's been a nasty winter in Calgary... we aren't used to so many days in a row of cold. A duo of delight, your steamy mugs of cocoa! I have this set, yet it's still awaiting attention! You've certainly inspired me to plan a play date with it! Carol, I hope you've played with it! Nice card Nancy. Love your colour choice. Since comment posted twice, I deleted one of the comments. I do love this card. so cute love the cocoa and marshmellows! Love the clean and simple look! I love that you left the background plain and let the mugs be the focal point. Thanks Kathy! Sometimes it's hard to not be afraid of the white space! Yummy looking card! Your shading on each of your mugs is absolutely amazing! Mmmmmm - little marshmallows and hot chocolate; much needed in Calgary today. Much needed in Calgary all month! Nice warm card. Makes me thirsty. I had to go make a cop of hot chocolate after I made it LOL! 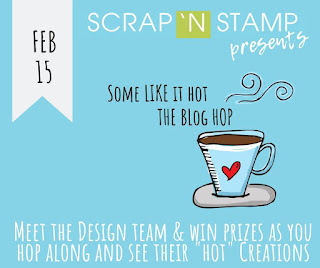 Chris... check out the Scrap ‘n Stamp blog... you’re a winner!! So Cute! 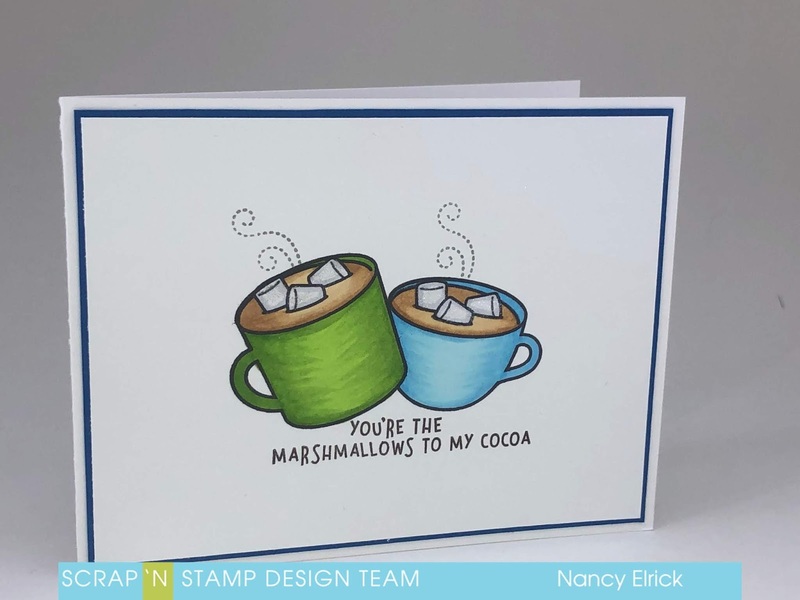 Thanks for sharing this toasty warm card on this freezing cold day! Nice and simple. I wish I could color like you. I'm not really all that great in comparison to others... I just don't have the patience for it. Try to two colour shading instead of the three... I find it's so much easier! Love this sentiment! And now I’d love some cocoa! I say go make yourself a mug! Love your card and hot chocolate is definitely desirable at this time of year! We get a lot of snow where we are! Great sentiment and design! Love your colouring too! We've had a cold winter here in Calgary.... we often get cold temps but they don't last as long as they have in February. I am dreaming of something closer to 0C!